The Villano is a quadruple torch flame lighter. The Villano is a quadruple torch flame lighter. It has a manual action flip top, built-in cigar punch cutter, and color changing fuel level indicator that will tell you when it is time to re-fill. 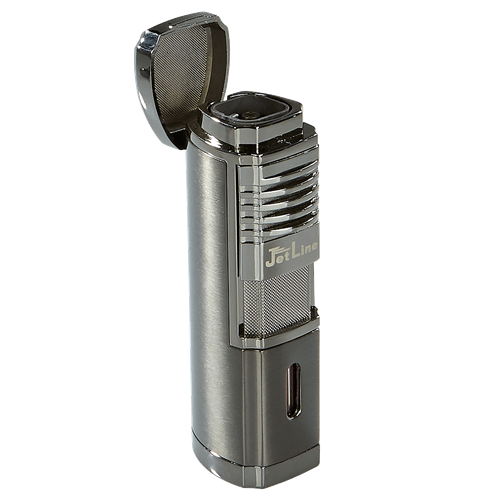 The JetLine Villano Quad Torch Lighter Gun Metal is constructed from premium quality components, which can be immediately felt by the strong spring in its cap and ignition trigger. Included is a small tool that can be used to adjust the flame, as well as an extra punch cutter. Great lighter, great price, buying this bad boy should be a no brainer.